In the first decade of the twentieth century, an enterprising man in Grand Rapids, Michigan, named A.W. Van Bysterveld claimed that he could “locate the cause of your aches and pains” for free via the mail, if only you would send him a vial of your urine. Van Bysterveld was a self-proclaimed “Expert Inspector of Urine” and claimed that he used a “secret process handed down generation after generation, and most carefully guarded by the old families of Europe.” Van Bysterveld assured prospective clients that though his “secret methods are not taught in schools,” he “examines on an average of 25,000 bottles of urine a year. This alone stamps him as an authority of exceptional qualifications” (Cramp 1911a, 56). 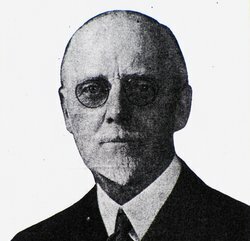 Between March and November 1910, the American Medical Association’s (AMA) Propaganda for Reform Department, led by Dr. Arthur J. Cramp, investigated Van Bysterveld’s claims. A sample (containing tap water, pepsin, aniline dye, and ammonia) prepared by the chemists at the AMA was sent to the Van Bysterveld Medicine Company. The diagnosis came back: “Careful examination of the urine shows there is too much acid in the blood, which will cause a rheumatic condition, the back is weak, and you will have a tired nervous feeling most of the time” (Cramp 1911a, 56). Meanwhile, correspondents working with Cramp in Iowa and Michigan contacted Van Bysterveld’s company and sent in samples that were identical to the first vial from the AMA. This time, the mixture in one case indicated poor blood, a malfunctioning liver, gas, nervousness, and heart problems; in the other case, it indicated weakened kidneys, a “catarrhal condition [inflammation of mucosal membranes] of the stomach and bowels,” and nervousness (Cramp 1911a, 56–57). Lastly, two more samples were sent in from different addresses in Chicago. This time, both vials were filled with 95 percent tap water with 5 percent glucose. This would indicate that the patient was not merely diabetic but was urinating a substance with more than twice the sugar content of a Red Bull. Again, the diagnoses came back as either liver disease or a catarrhal digestive track. Cramp’s conclusion was unequivocal: “The whole things shows conclusively that the ‘examination’ of the urine is a farce, the diagnosis is a fake, and taking the money from victims for the ‘treatment’ of a purely imaginary disease is a fraud and a swindle” (Cramp 1911a, 57). Cramp further condemned those who profited from this mail-order pseudomedical company: “Those publications which accept the advertisements of this concern are, wittingly or unwittingly, participating in the profits of scoundralism” (Cramp 1911a, 57). Arthur J. Cramp, MD, played an outsized but oddly unacknowledged role in the professionalization of American medicine. American medicine after the Civil War was still unorganized and largely unregulated. Practitioners needed little formal education and no single commonsense, science-based standard of evidence for treatments applied. As a result, numerous competing schools of thought and private interests fought for the attention of the American consumer, who was barraged with advertisements for nostrums and cures on nearly every page of every popular periodical. The American Medical Association, founded in 1847, had always looked down on secret proprietary treatments, and it saw as an important part of its mission the suppression of quack medicine. For instance, Eric W. Boyle notes that the AMA reserved the right to refuse admittance of journals that advertised proprietary medicines into the Association of Medical Journal Editors, a group that had been established by the AMA to raise the standards of medical publications. Nonetheless, the revenue generated by advertising questionable remedies was so substantial that even the Journal of the American Medical Association (JAMA) failed to uphold its own standards until the turn of the twentieth century (Boyle 2013, 12–3). Dr. Cramp contributed to the professionalization of American medicine by identifying and exposing quackery; subjecting claimed remedies to scientific analysis; assisting government, public, and professional policing efforts directed at controlling health fraud; and pursuing an aggressive thirty-five–year public education program. Arthur J. Cramp was born in London on September 10, 1872. According to British public records, his father was a blacksmith, and at the age of sixteen, Cramp was apparently an engineer’s apprentice. He moved to the United States at twenty. According to an undated biographical blurb in the files of the AMA, Cramp “did farm work in Missouri for a few years, attended an academy in that state. And then taught in a country school, at the same time writing a weekly column in the local newspaper” (Cramp, Arthur J, Special Data, n.d.). He married a woman from Missouri named Lillian Torrey. Cramp’s family eventually settled in Waukesha, Wisconsin, where he and his wife worked at the Wisconsin Industrial School for Boys, a reformatory high school. According to the 1900 census records, they lived on the campus where they worked. Long before he became a quackbuster, then, he was an educator, and that ethos informed his later work. While at the school, they had a daughter, Torrey, who died a little over a year later. According to her death record, Torrey died January 2, 1900, from seizures related to meningitis. According to a letter from a colleague at the AMA to the historian of American quackery, James Harvey Young, Torrey’s death while being treated by a quack is what compelled Cramp to pursue medicine and expose quackery. (It should be noted, however, no effective treatments for communicable meningitis existed at the time.) In 1906, Cramp graduated from the Wisconsin College of Physicians and Surgeons and joined the American Medical Association (Cramp, Arthur J., Correspondence, n.d.) as a medical editor in December of that year. Cramp joined the AMA at a particularly auspicious time for practitioners who sought to combat quackery, as the country was in the middle of a period of progressive reforms. In 1905, the year before Cramp was hired, the AMA established the Council on Pharmacy and Chemistry, an in-house lab that analyzed the contents of patent medicines. That same year, Samuel Hopkins Adams published a series in Collier’s that would be collected in an edition called The Great American Fraud, a monumental and damning exposé of modern medical charlatanry. Adams named names of fake practitioners, revealed the alcohol and narcotic content of supposed cures, and laid bare the profitable codependence of nostrum advertisers and publishers. In 1906, Upton Sinclair published The Jungle, a novel based on his observations of appalling and dangerous conditions in Chicago’s meatpacking industry. All of this occurred at the same time a pure food and drugs bill was moving through the Congress. The Pure Food and Drugs Act of 1906 regulated claims that were made on drug packaging, but in 1911 it was interpreted by the Supreme Court very narrowly to mean only that the ingredients on the label needed to be accurate. Claims of effectiveness remained unregulated. The 1912 Sherley Amendment was introduced to close this loophole, but during the legislative negotiations language regulating “false or misleading” claims was replaced by “false and fraudulent,” which introduced the question of intent into legal matters, a more difficult case for regulators to prove (Cramp 1924, 424–425). In 1910, the Carnegie Foundation released what was known as the Flexner Report, a comprehensive survey of medical education in the United States and Canada. The report led to reforms that standardized medical education, established scientific medicine as the educational gold standard, and diverted educational resources and accreditation away from homeopathic, proprietary, botanical, and eclectic medical schools (Page and Baranchuk 2010, 74). All these developments informed and validated the AMA’s work of shedding light on proprietary medicines and quackery through aggressive public education, a campaign in which Cramp would feature prominently. The American Medical Association, as part of its attempt to promote the interests of its members, became, in the words of Eric W. Boyle, “the primary arbiter in disputes over the legitimacy of medical therapies” (Boyle 2013, 62). This aspect of the professionalization of American medicine was achieved largely through the efforts of Arthur J. Cramp. As soon as Cramp was hired on as an editor of the Journal of the American Medical Association, he began contributing regular pieces about quackery to it. As part of the general push to improve the quality of medical information available to physicians and the public, the AMA established the Propaganda for Reform Department, which grew out of the Council on Pharmacy and Chemistry and was headed by Cramp (Cramp 1933, 51). Cramp believed in what he once called “public education through publicity” (Cramp 1920, 788), and he believed that “the best that the medical profession can do in protecting the public is to turn the light on the methods of the faddist and the quack, so that his ignorance or fraud becomes apparent” (Cramp 1927b, 727–728). This was the mission of the Propaganda for Reform Department, which became the Bureau of Investigation in 1925 and the Department of Investigation in 1958 (Hafner et al. 1992, viii). He quotes the lab report, in which the chemists suggest that Spray-O-Zone was borax and potassium nitrate dissolved in water. A synopsis of the cursory qualitative evaluation of Spray-O-Zone appeared in the February 12, 1927, edition of the Journal of the American Medical Association (Cramp 1927a, 501). All of these items, and the packaging material, are preserved in the Spray-O-Zone folder. Through thousands and thousands of similar exchanges with physicians, regulators, and members of the public, Cramp steadily amassed a vast arsenal of information to unleash against medical hucksters and their enablers. Within five years of arriving at the AMA, according to historian James Harvey Young, “Cramp’s office contained over 12,000 cards in a ‘Fake File,’ listing products, firms, and names of promoters. His ‘Testimonial File’ held the names of over 13,000 American and 3,000 foreign doctors who had given testimonials for proprietary drugs” (Young 1967, 131–2). By 1937, this card catalogue had expanded to some 300,000 entries (Boyle 2013, 80). Eventually, the collection would grow to 3,500 files spread over some ten thousand folders, totalling 370 cubic feet of material, or, as the archivists who described and catalogued the entire collection put it the 1990s, 185 standard file drawers (Hafner et al. 1992, x). Cramp made extensive use of this collection during his time at the AMA. He wrote a weekly column in JAMA, where he put the extraordinary medical claims to scrutiny, and he contributed the occasional article to H.L. Mencken’s American Mercury magazine and the AMA’s popular health magazine, Hygeia, for which he was an advisor (Fishbein 1969, 132). Not only did he investigate the products and quacks, but he also looked into the histories of the people involved, gathered information about their business plan, fact-checked advertisements, discussed the reasons that quacks were so convincing, and generally pulled back the curtain of a type of medicine grounded in marketing rather than science. Among Cramp’s other duties, he answered thousands of letters written to the AMA by laymen, Better Business Bureaus, and the advertising managers of publications that vetted ads they printed (Cramp 1933, 52). His department also supplied services that members of the public sought from government agencies, for instance, handling queries about questionable medical claims, products, and services that had been redirected to the AMA by local, state, and federal authorities. The AMA answered questions from government authorities seeking information about questionable medical practices that had appeared in their jurisdictions, and, said Cramp, “[played] an important part in bringing to the attention of state and federal officials schemes and methods that seem to be a menace to the public health, a violation of the law, or both” (Cramp 1933, 53). Starting in 1912, the Bureau also published educational materials, including posters, slide shows, and offprints of Cramp’s JAMA articles about different forms of quackery. Much of that material, in turn, was gathered into Cramp’s three volumes of Nostrums and Quackery, which he described as “a veritable encyclopedia on the nostrum evil and quackery” (Cramp 1933, 51–53). These were published between 1911 and 1936. Cramp was so central to the fight against quackery in the early twentieth century, Young remarks, that “scarcely an investigation was launched by a regulatory agency but that an inquiry went to Cramp to see what information the AMA already had on hand” (Young 1967, 132). 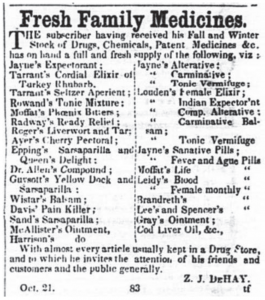 Cramp lamented the passing of this older type of advertising, which merely listed available products, as well as the rise of “selling copy,” which created a false need for medicine in prospective consumers (“Fresh family medicines” 1851). One of the challenges that dogged Cramp throughout his career was lax advertising standards. Though the Pure Food and Drug Act regulated what could be said on drug packaging, it did nothing to regulate advertisements and marketing of drugs elsewhere. Cramp knew that he was fighting an uphill battle as long as patent medicine manufacturers were able to market directly to potential consumers. His critiques of nostrum advertisements tended to focus on a few themes. First is the use of “selling copy,” which sought to plant a need for a product in the minds of a target audience rather than indicating where products for a preexisting need could be found. In practice, ads for quack remedies were intended to convince members of the public that they were sick with a particular condition, a sort of unethical, induced hypochondria. “No man,” Cramp argued, “has any moral right to so advertise as to make well persons think they are sick and sick persons to think they are very sick. Such advertising is an offence against the public health” (Cramp 1918, 757). He roundly condemned “such periodicals and newspapers as are not above sharing the blood-money” of quack remedies (Cramp 1911b, 134). He saw these periodicals as enabling especially cruel fraudsters, or as he described them, “The swindler who sells stock in bogus companies to presumably intelligent human beings is a gentleman compared with those scoundrels who lie to the sick, humbug the suffering and fraudulently take the money of the incapacitated” (Cramp 1911a, 56). He lamented the same difficulty modern quackbusters have in convincing the already committed that they are wrong and notes the power of the post hoc fallacy, which allows patients to mistake “sequence for effect” (Cramp 1918, 756). Cramp also despised the use of testimonials in advertising, knowing how misleading they could be. Cramp’s fights against testimonials were some of his most devastating attacks on quacks’ credibility. A 1913 investigation into a supposed tuberculosis cure called Pulmonol is a case in point. Cramp then lists nine patients who had provided testimony on behalf of Pulmonal that had appeared either in newspapers or in advertising pamphlets. Cramp had statements from patients’ physicians and some of the patients themselves, and, as so often was the case, he often found that the patients had either never been sick (if they existed in the first place), had self-diagnosed their disease, were still sick, or had died of the ailment they thought they had beaten (Cramp 1913, 1998–1999). 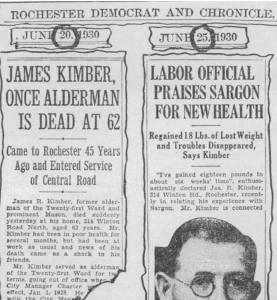 When possible, Cramp would juxtapose a patient’s testimonial with their obituary, as was possible when “Sargon,” a preparation that was 18 percent alcohol, placed an ad in the Rochester Democrat and Chronicle featuring JR Kimber’s testimony on June 25, 1930, five days after the same paper had announced his death (Cramp 1930, 285). Especially vexing to Cramp was that the Pure Food and Drugs Act regulated claims made only on packaging, not the claims made elsewhere. He used this fact to suggest a clever way that the public could check the magnitude of nostrum makers’ false claims: “One can with almost mathematical accuracy determine the falsity of modern ‘patent medicine’ advertising: Subtract the claims made on the trade package from those made elsewhere; what remains—and the residuum will be large—is falsehood!” (Cramp 1920, 788). Another important aspect of Cramp’s educational project at the AMA was to give public lectures to schools, professional groups, and civic organizations across the country. He gave talks on subjects such as “Patent Medicine and the Public Health,” “Pink Pills and Panaceas,” “Fighting Deafness Quackery,” and “Objectionable Medical Advertising.” The AMA did not charge for Cramp’s appearances (they only asked that a projector be available for his slides). During the early 1930s, Cramp was giving dozens of talks a year. In his retirement, he moved to Fort Lauderdale and then to North Carolina. After he retired, he still corresponded with the AMA and his editor Morris Fishbein, and he completed and published the third and final volume of Nostrums and Quackery. Cramp wryly noted, “By the time the patent was granted the inventor was dead and his estate got it. Since, by the use of his own preparation he should have been immune to practically all diseases, he probably died of senility” (Cramp 1926, 191–192). His colleagues at the AMA joked that quacks “had been pursued into the beyond by Doctor Cramp and his unrelenting ridicule” (Cramp, Arthur J., Correspondence). The AMA closed the Department of Investigation in 1975. The files that Cramp and his successors had gathered over the decades became known as the American Medical Association Health Fraud and Alternative Medicine Collection, which is the only AMA archive that is open to non-members. Boyle, Eric W. 2013. Quack Medicine: A History of Combating Health Fraud in Twentieth-Century America. Santa Barbara: Praeger. “Cramp, Arthur J., Correspondence, May, 1934–August, 1963.” Folder 0176-03. American Medical Association Historical Health Fraud and Alternative Medicine Collection. American Medical Association, Chicago. “Cramp, Arthur J, Special Data.” Folder 0175-10. American Medical Association Historical Health Fraud and Alternative Medicine Collection. American Medical Association, Chicago. Cramp, Arthur J. 1911a. The Van Bysterveld Medicine Company. Journal of the American Medical Association 56(1) (January 7): 56–7. ———. 1911b. Lawrence Hill, A.M., D.D., M.D. : Another consumption cure fake in Jackson, Michigan. Journal of the American Medical Association 56(2) (January 14): 134–137. ———. 1913. Pulmonol. Journal of the American Medical Association 61(2) (November 29): 1998–1999. ———. 1918. Modern advertising and the nostrum evil. American Journal of Public Health 8(10) (October 1): 756–758. ———. 1920. Truth in advertising drug products. American Journal of Public Health 10(10) (October): 783–789. ———. 1924. Therapeutic thaumaturgy. The American Mercury (December): 723–30. ———. 1926. Patent office magic—medical. The American Mercury (June): 187–194. ———. 1927a. Some miscellaneous nostrums. Journal of the American Medical Association 88(7) (February 12): 501. ———. 1927b. Fakes and fads in deafness cures. Bulletin of the New York Academy of Medicine 2(12) (December 1): 726–728. ———. 1930. A posthumous testimonial. Journal of the American Medical Association 95(4) (July 26): 285. ———. 1933. The work of the Bureau of Investigation. Law and Contemporary Problems 1(1) (December): 51–54. Deaths. 1951. Journal of the American Medical Association 147(18) (December 29): 1773–1774. Fishbein, Morris. 1969. Morris Fishbein, M.D. : An Autobiography. Garden City, NY: Doubleday. Fresh family medicines. 1851. Semi-weekly Camden Journal 2(90) (November 14): 1. Hafner, Arthur W., James G. Carson, and John F. Zwicky, eds. 1992. Guide to the American Medical Association Historical Health Fraud and Alternative Medicine Collection. Chicago: American Medical Association. Page, Douglas, and Adrian Baranchuck. 2010. The Flexner Report: 100 years later. International Journal of Medical Education 1: 74–754. “Spray-O-Zone, 1925–1927” Folder 0818-14. American Medical Association Historical Health Fraud and Alternative Medicine Collection. American Medical Association, Chicago. The work of Dr. Cramp. 1937. British Medical Journal 1(3975) (March): 565. Viquerat, Alois. 1913. Medicinal composition. US 1081069 A. (December 9). Google Patents. Available online at https://patents.google.com/patent/US1081069. Young, James Harvey. 1967. The Medical Messiahs: A Social History of Health Quackery in Twentieth-Century America. Princeton: Princeton University Press. The authors would like to thank Eve Siebert for her assistance in genealogical research and the student tutors of the Stockton University Writing Center for help deciphering truly baffling handwriting. Robert Blaskiewicz (robert.blaskiewicz@stockton.edu) is assistant professor of critical thinking and first-year studies at Stockton University in Galloway, New Jersey. He studies medical quackery, conspiracy theory, and pseudoscience. Mike Jarsulic (mjarsulic@bsd.uchicago.edu) is the senior HPC administrator at the University of Chicago’s Biological Sciences Division. His skeptical interests include cancer quackery, the history of skepticism, and philosophy of science. Bob Blaskiewicz is Assistant Professor of Critical Thinking and First Year Studies at Stockton University, where he specializes in and teaches about World War II veterans’ writings, science and pseudoscience, extraordinary/paranormal claims and conspiracy theory. He is the Committee for Skeptical Inquiry’s “Conspiracy Guy” web columnist, a blogger at skepticalhumanities.com, a regular panelist on the live weekly web show The Virtual Skeptics (Wed 8PM Eastern), and contributes a monthly essay to the Skepticality podcast. He also works with an elite cadre of skeptical superheros on The OTHER Burzynski Patient Group website, The Houston Cancer Quack page, and the Skeptics for the Protection of Cancer Patients Facebook group.